Freedom comes with realizing that our fear is not real. 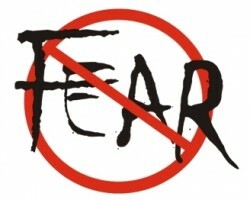 ​Our fear is created by the beliefs and thoughts we let rule our lives. Whether we fear snakes, being alone, losing a job or death, all fear is empowered by the beliefs we carry. The death of a loved one will hurt, and we will feel loss. But fearing that experience is a choice. Losing a job may create hardship or unknown consequences, but fear is not an intrinsic component of loss. If we can courageously choose to feel our experiences rather than fear them, we may discover a range of possible reactions, including wonder and awe, a well of inner strength, a softness within us that allows for the tenderest of connection. It is said that love is the opposite of fear. When we foster beliefs based in love, we expand our possibilities, our faith, our compassion for others, and our value of ourselves.